Great shape and design with functioning waterproof breathable (WPB) material, but just not enough of it. Shape and design. Large U-shaped entry makes it easier to get in and out of than a lot of bivys. 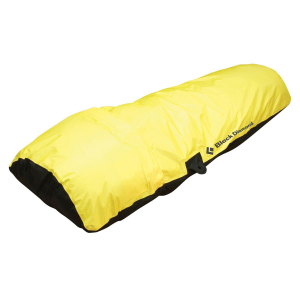 Head area is well ventilated with flexible options. Can leave the large U-shaped entry open or closed. Can leave the secondary screen netting door open or closed. The top blue WPB material breathed well in temperatures near freezing—no noticeable internal condensation on it. Roomy. On recent winter trip, I easily fit my foam pad, air pad, sleeping bag, and quilt all inside. Long size is roomy enough for stomach sleepers (which I am). Nice storage sack—large opening to get the bivy in and circumference drawstring that then compresses contents for storage. The yellow patch on top of foot box is not breathable. Accumulated significant amount of condensation that wet the top of my sleeping bag. Would have been nice to have the blue WPB material extend some more on the sides. I bought the blue-yellow-black 2017 long sized model online, on sale for 35% off normal retail price. 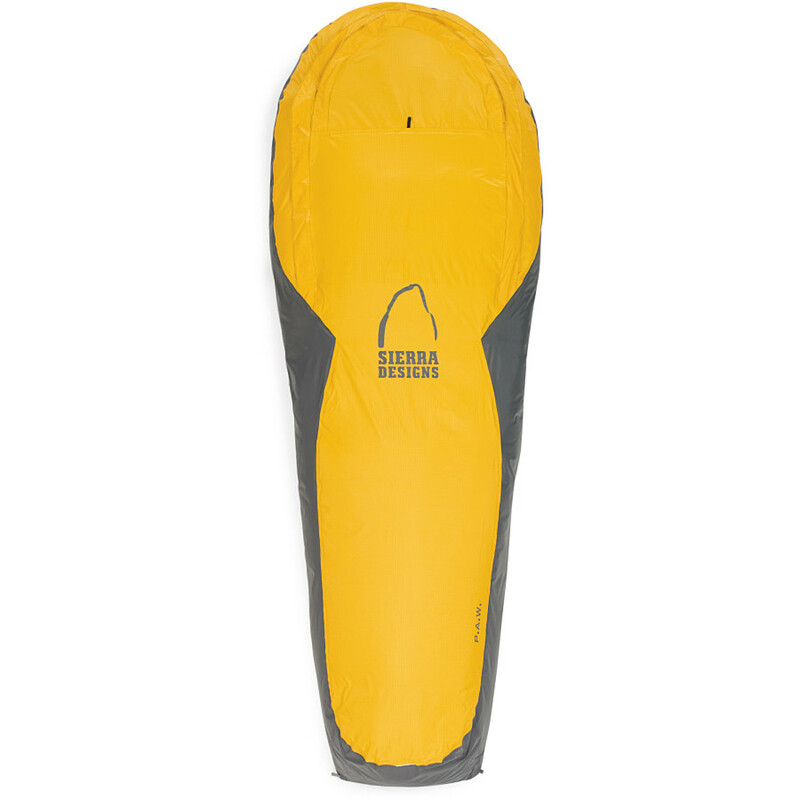 Overall, at that price point, I give this bivy a grade “good”, but NOT “very good”. Had I paid full retail price, I’d give it a lower grade due to top yellow patch not being breathable. The wet spot the yellow patch created on my bag was more noticeable, and took longer to dry than the minimal amount of moisture created by the black side material. 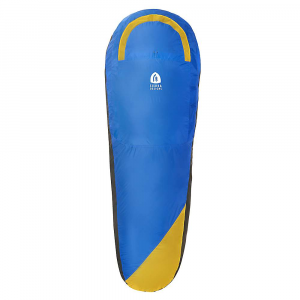 The 30D black side and bottom material is similar to that of my one-person tent and does accumulate some condensation just like my tent—so I do not consider it a con. The manufacturer/designer should have extended the blue WPB material across the FULL length of the top—to include the foot box. 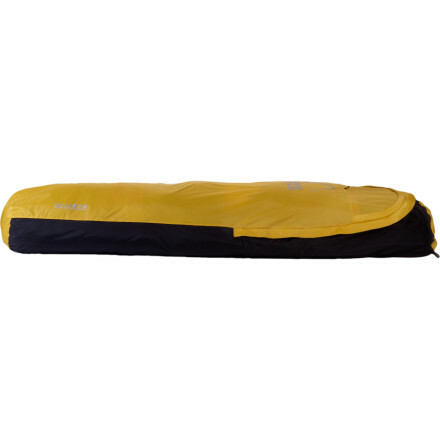 Overall, I do like the design of this bivy with its larger entry and flexible head area ventilation options. 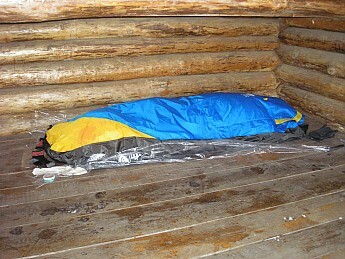 After a snowy night in three-sided trail shelter with temperatures in the low 30s / high 20s degrees Fahrenheit. 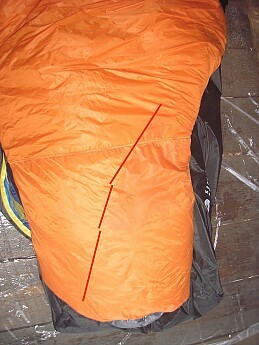 My sleeping bag removed from the bivy. I annotated this photo with red lines. Area to right of red lines was under the yellow fabric. Note the darker wet spot corresponding to the previous photo. Good news is the blue fabric is breathable as advertised since the area to the left of, and above, the red line is dry. Welcome to Trailspace, Greg. 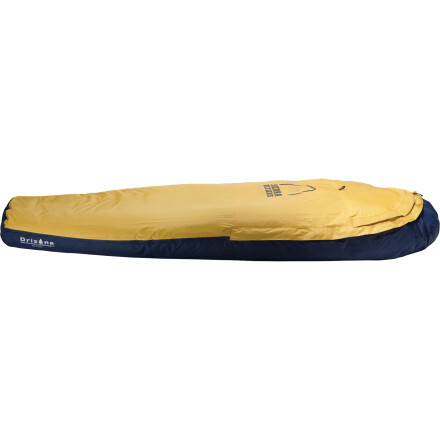 Thanks for reviewing your bivy. Do you have any pics of it to share? Welcome to Trailspace, Greg! 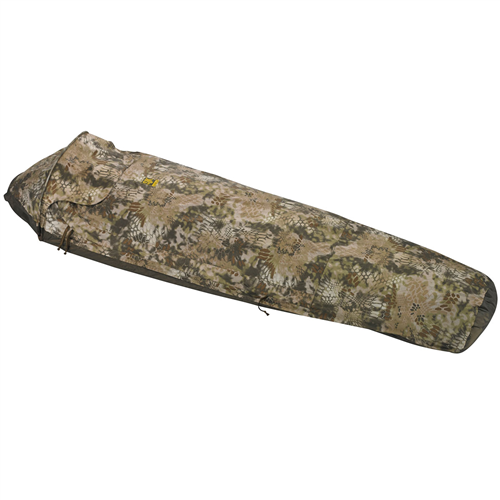 Nice review of your SD bivy. I'd also love to see some pictures of it in your review. Thanks for the update and helpful pictures, Greg! I've spent 10 plus nights in this bivy so far, in Arizona, Colorado, and Utah. Overall, a great piece of equipment that I plan on continuing to use. The bug netting is a huge plus. I hate being woken up by bugs flying in my face. 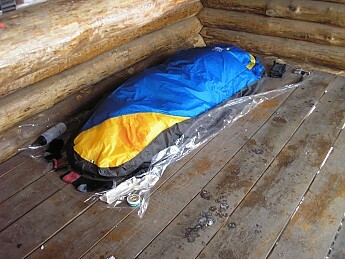 To avoid this, I can zip the bivy closed and open up the "door" over the netting and sleep peacefully. Overall, good bivy. 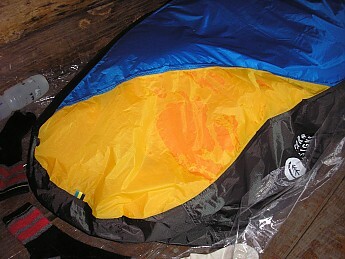 Condensation has been the biggest con, but is usually an issue with most bivy sacks. The worst condensation I experienced was after a warm night of intermittent rain storms in Utah—go figure. I stayed dry, but the inside of the bivy and outside of my down bag were pretty wet. Otherwise, I love the bug netting, the size of the bag, and how small and lightweight it packs.